Who doesn’t love a crunchy biscuit with berries? We have this wonderful recipe here for you that has Goji Berries in it so it is packed with Vitamin C and some natural goodness! These biscuits are a bit more intricate than your normal biscuit recipe but we thought it’s so much fun sometimes to just do something a bit more challenging and think outside the box! They’re nice and crunchy, airy and packed with a delicious goji taste! If you end up making these biscuits- make sure to tag us on Instagram and let us know as we love seeing you all trying out our recipes! In a bowl, whip the aquafaba with sugar with an electric mixer until the mixture is really fluffy and firm. Add the coconut and 3 tbsp of goji berries in a food processor and blend them into a flour. Add the flour into the meringue and mix gently from the bottom to top so you don’t ruin the meringue. Scoop 1 tbsp of dough onto the tray, leaving space between the cookies so they can spread as they bake. 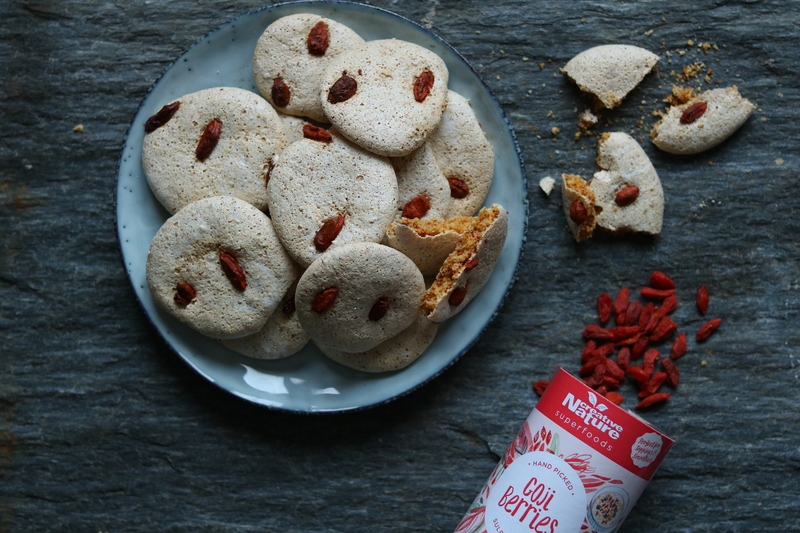 Sprinkle the cookies with the rest of goji berries. Bake at 130 degrees for 40 minutes. When they are done baking- switch off the oven and let the cookies cool in the oven until they are fully cooled to prevent them from breaking and collapsing.